Did you miss this great new webinar? Diesel Essentials For The First Mate, a “must see” webinar for cruising couples, is now available as a recording from GLCCSchool. Click here for more information and to purchase the recording of this excellent webinar. We all know how important a smooth-running engine is to our cruising adventures. But how many crew members on your boat know how to keep your engine happy? If your answer is “one,” we invite you to join the owner of Great Lakes Diesel and master mechanic, Jim Zima, as he walks you through the basic steps of daily diesel engine maintenance. 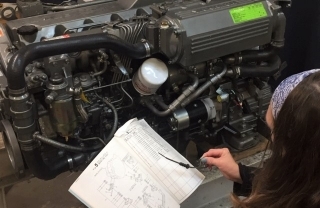 His webinar covers ten basic but crucial engine maintenance tasks any crew member can learn and immediately put to use. As we all know, when it comes to cruising two heads are better than one.